There are far too many people piercing who have no right to be holding a needle! The links at the bottom of the page will help you find a knowledgeable piercer and answer any questions you may have. Our staff are very knowledgeable about placements, size, gauge and style of jewelry for each piercing. We have a large stock of piercing jewelry to ensure that the correct type is used for each customer. If incorrect size and style of jewelry is used , often a piercing will grow out, or heal slowly. We buy only from manufacturers who consistently produce highly polished, well shaped and finished jewelry. A piece of jewelry which is not correctly finished will irritate a new piercing and cause considerable problems until it is replaced. Your piercing will have the best start it could possibly have and then it is up to you to take care of it. Our aftercare instructions are continually being brought up to date and if they are followed, piercings will usually heal in a very short time. We are not doctors and therefore we can only suggest an aftercare regime, but the instructions we give have been reviewed medically and have been found to work. If a healing problem should occur we are always at the end of the phone to offer help. We are very aware of the increased potential of disease transmission during the piercing procedure and do our utmost to use universal precautions to prevent this happening. We are willing to help anybody who has a piercing problem, whether or not we pierced them. Often the problems we see are simply the result of inappropriate aftercare instructions , incorrect jewelry size or damaged jewelry. We carry a large selection of jewelry for healed piercings and we are also able to order special items or items not in stock from our suppliers. Our prices are low - this does not mean that the quality is poor - we prefer to turnover the jewelry fast and compete with the stores in the Mall. 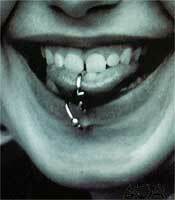 All kinds of piercings, from mild to wild at the BME Ezine site!